The following is a list of those civilians killed by enemy action in the Borough of Yeovil during the Second World War. In addition three bodies remained unidentified and are thought to perhaps have been unofficial evacuees. The list does not include soldiers whose bodies were taken by the military authorities. Florence Batstone was killed during the first Yeovil air raid on 7 October 1940. She was sheltering in Montague Burton's shop in Middle Street with her husband Reginald. The Western Gazette edition of 18 October 1940 reported "Mr and Mrs Reginald James Batstone, of Ham Hill, were buried together at the East Stoke Churchyard on Saturday. The Rev. A.W. Turner, Methodist Minister officiated." Her name is inscribed on the War Memorial in the Borough. Reginald Batstone was killed during the first Yeovil air raid on 7 October 1940. He was sheltering with his wife Florence in Montague Burton's shop in Middle Street. Mr Batstone's name is not on the War Memorial in the Borough. Amelia Bell was killed in the ninth air raid on Yeovil, 25 May 1941, when her home at 136 Mudford Road was destroyed by a high explosive bomb. The Western Gazette edition of 30 May 1941 reported "The death has occurred at the age of 57, of Mrs Amelia Bell of 'Langbrae' Mudford Road, Yeovil, a native of Edinburgh, who has been living here for the past six years. Mrs Bell, who was the daughter of the late Mr and Mrs John Waddle, of Edinburgh, was the wife of Mr William James Bell, who joined the Canadian Regiment known as 'The Rocky Mountaineers' in the Great War and was killed at Vimy Ridge shortly before his only son was born." Her name is inscribed on the War Memorial in the Borough. Winifred Bright was sheltering in the air raid shelter at the Vicarage Street Methodist Church when a high explosive bomb hit the shelter during the first air raid on 7 October 1940. She was fatally injured during the explosion and died in Yeovil Hospital two days later. The Western Gazette edition of 18 October 1940 reported "The funeral of Mrs Winifred A Bright, wife of Mr R(eginald Richard John) Bright, took place at the Cemetery, preceded by requiem Mass at St Michael’s Church. Mrs Bright was a regular worshipper there, and took an active part in the church work. The service was conducted by the Rev SV Purcell, and Mrs Sims (friend) was at the organ." Mrs Bright was 37 years old and her name is inscribed on the War Memorial in the Borough. Mary Bugler, wife of John Henry Bugler, was also sheltering in the air raid shelter at the Vicarage Street Methodist Church when a high explosive bomb hit the shelter during the first air raid on 7 October 1940. She was fatally injured and died in Yeovil Hospital later that day. She was aged 58 and her name is inscribed on the War Memorial in the Borough. Jessie Culvert, wife of Charles Edwin Culvert, of 42 Westland Terrace was critically injured during the fifth air raid on Yeovil of 26 March 1941 when the Westland Road area was bombed. Mrs Culvert died later that day in Yeovil Hospital. She was aged 23 and her name is inscribed on the War Memorial in the Borough. Kathleen Denmead of 132 Mudford Road was killed during the ninth air air on 25 May 1941 when her home was destroyed by a high explosive bomb. Miss Denmead, the sister of Mrs Rose Haines (see below), was aged 25 and was buried in Yeovil Cemetery. Her name is inscribed on the War Memorial in the Borough. Joyce Dodge, of Houndstone, was killed while sheltering in an air raid shelter in the garden of 103 Preston Grove. The shelter received a direct hit during the second air raid of 8 October 1940. Miss Dodge was aged 18 and was interred in the Churchyard of St Andrew’s Church, Brympton D’Evercy. Her name is inscribed on the War Memorial in the Borough. Elsie Farwell of 6 Dampier Street was injured when a single bomb landed in Dampier Street dropped by a pair of Focke Wulf FW190 fighter bombers during the tenth and final air raid on Yeovil during 5 August 1942. Miss Farwell died in Yeovil Hospital the following day. The Western Gazette edition of 14 August 1942 reported "The funeral took place on Monday of Miss Elsie Farwell, who died last week aged 59. She had been a member of the Salvation Army for over forty years being particularly associated with the Young People’s Corps at Yeovil and had held the position of Record Sergeant for many years. The service at the Temple was conducted by Major Frank Bowles, assisted by Mrs Bowles and Adjutant M Bicknell. The band, conducted by Bandmaster J Stannard preceded the cortege to the Cemetery, where they played music around the graveside." Her name is inscribed on the War Memorial in the Borough. (See William Fitkin below). Anthony was aged three years and five months and his name is inscribed on the War Memorial in the Borough. The family were interred in St Catherine's churchyard, Montacute. (See William Fitkin below). Olga Fitkin was aged 29. Her name is not inscribed on the War Memorial in the Borough but is on the memorial plaque in the Octagon Theatre. The family were interred in St Catherine's churchyard, Montacute. William Fitkin of 101 Preston Grove, his wife Olga and baby son Anthony (see above) were killed in the second air raid during 8 October 1940 while sheltering in an air raid shelter in the garden of 103 Preston Grove. The shelter received a direct hit during the air raid. The Western Gazette's edition of 18 October 1940 reported "The death has occurred of Mr James Fitkin, aged 31, eldest son of the late Driver H Fitkin and Mrs P Hallett, of 32 Mount Pleasant, Yeovil; also of his wife, Olga Joyce Fitkin, aged 29 youngest daughter of Mr and Mrs Fred Rogers, of 16 St. Michael’s View, Montacute; and their son, Anthony Maxwell Fitkin, aged three years and five months. Mr Fitkin had been employed as a carpenter by Messrs D Singleton & Son, builders of Yeovil, ever since his apprenticeship with the firm, and he had served as a special constable since the outbreak of war. His wife was well-known in Montacute and Yeovil and prior to their marriage had been employed for eight years in the offices of Messrs Aplin and Barrett, and for 15 years had been a member of the choir of St Catherine’s Church, Montacute. She had also been a member of the Parochial Church Council. The funeral was at Montacute and all three were buried in one grave, which had been lined with flowers by Mr Margery. The Rev RT Beechy, vicar of Montacute, who had officiated at the wedding of Mr and Mrs Fitkin, six years ago, conducted the funeral service in St Catherine’s Church, the entrance to which was lined by members of Yeovil Special Constabulary, and by Mr Fitkin’s workmates." His name is inscribed on the War Memorial in the Borough. Leslie Forsey of 48 Grove Avenue was killed during the first air raid on Yeovil on 7 October 1940 when a high explosive bomb made a direct hit on an air raid shelter at 45 Grove Avenue. In its edition of 18 October 1940 the Western Gazette reported "Two victims of an air raid in another part of the country were buried at Axminster Cemetery on Friday afternoon, a joint funeral service being conducted by the Vicar (the Rev FH Sanders). The victims were members of two well-known families in the Axminster district, Mrs Myra Joan Morris (see below), aged 50, and Mr Leslie Forsey, aged 31. They were killed in the same raid. Mrs Morris was the wife of Mr G. Morris, who was formerly a recorder of the East Devon Milk Recording Society. She was the only daughter of Mrs Major, of Great Trill Farm, Axminster, and the late Mr WJ Major. There are two daughters, the Misses Frances and Marjorie Morris. Mr Forsey, who was within a day of his 32nd birthday, was engaged to Miss Francis Morris. He was the third son of Mr and Mrs ES Forsey, of Higher Doetshayne Farm, Musbury. He was formerly employed by Messrs Dawkins, Axminster, for five years as a driver salesman." Leslie Forsey was interred at Axminster cemetery and his name is inscribed on the War Memorial in the Borough. Norman Gay, of 68 Park Street, was killed during the first Yeovil air raid on 7 October 1940 while he was sheltering in Montague Burton's shop in Middle Street. Norman Gay was aged 16 and he was interred in Yeovil Cemetery. His name is inscribed on the War Memorial in the Borough. Dennis Gillingham was killed during the ninth air air on 25 May 1941 when a high explosive bomb detonated near his home of 130 Mudford Road. The Western Gazette reported in its edition of 6 June 1941 "The funeral of Dennis Gillingham, aged ten, only child of Mr and Mrs P Gillingham of 130 Mudford Road, took place at Yeovil Cemetery on Thursday, the Rev EA Baker (assistant priest of St. Michael’s) officiating. Chief mourners were:- Mr and Mrs P Gillingham (parents), Mr and Mrs F Gillingham (uncle and aunt), Mr and Mrs W Leworthy (uncle and aunt), Messrs F and S Spearing (uncles), Mesdames F Gillingham and M Patten (aunts)." His name is inscribed on the War Memorial in the Borough. Minnie Guy of 24 Westland Terrace was killed during the fifth air raid on Yeovil of 26 March 1941 when the Westland Road area was bombed. She was aged 21 and was buried in Yeovil Cemetery. Her name is inscribed on the War Memorial in the Borough. Donald Haines, his wife Rose (see below) and sister-in-law Kathleen Denmead (see above) were all killed when a high explosive bomb destroyed their home, 132 Mudford Road, during the ninth air raid on 25 May 1941. The Western Gazette reported in its edition of 6 June 1941 "The death has occurred recently in a western town of Mr Donald Evan Haines (39), his wife, Mrs Rose Mary Haines (41) and Miss Kathleen Joyce Denmead (25) her sister. Mr Haines, who was the second son of Mr and Mrs John Haines of St Andrew’s Road, Taunton, will be missed by a wide circle of friends, notably among his professional associates at Lloyds Bank Limited, his fellow members of the Royal Observer Corps and in connection with the choir and C.E.M.S. of St John’s Parish Church. His cheery disposition and pleasing personality endeared him to all, for - as one of his colleagues said - “A merry heart doeth good like medicine.” Beginning as a junior at Taunton, he had served the Bank for twenty years, latterly as cashier. He joined the Dorset Yeomanry after the Great War, and served for three years, and was due to register for military service. Both he and his wife were keen members of the Choral Society of the town in which they lived and Mr Haines had been a member of the Parish Church choir for 16 years. He was also hon. secretary of the C.E.M.S., and of the local branch of the Church Mission to Jews. In addition to his parents two sisters and a brother are bereaved. One sister, now Mrs John Tinto, was well known as supervisor of the Telephone Exchange in the town. Mrs Haines and Miss Denmead were daughters of the late Mr and Mrs Thomas Denmead, and one sister and two brothers are bereaved - one, Mr Frederick Denmead, being well known as a former member of the Amateur Operatic Society, and an officer of the Regional staff of the Milk Marketing Board. The Parish Church was filled on Thursday afternoon for the funeral service, which was conducted by the Vicar." Donald Haines was buried in Yeovil Cemetery and his name is inscribed on the War Memorial in the Borough. Rose Haines was killed with her husband and sister when a high explosive bomb destroyed her home, 132 Mudford Road, during the ninth air raid on 25 May 1941 (see above). Rose Haines was aged 41 and was buried in Yeovil Cemetery. Her name is inscribed on the War Memorial in the Borough. Madeline Hann was critically injured at the Westland Aircraft Works during the fifth air raid on 26 March 1941. She died later the same day at Yeovil Hospital. The Western Gazette reported in its edition of 4 April 1941 "The funeral of Mrs Madeline Emily Hann, aged 31, wife of Mr Albert G Hann, of 67 Reckleford, Yeovil, and eldest daughter of Mr and Mrs WE Sharp, of 'Lucerne', Acreman Street, Sherborne, took place at Yeovil Cemetery on Tuesday, the Vicar of Yeovil (Rev H Mortlock Treen) conducting the service at the chapel, and the Rev. ACA Selbek, at the graveside. Mrs Hann, who had been married just over a year, was a qualified nurse and had served both at Sherborne and Wells Hospitals, and was a valued member of the First Aid Party at her place of employment for nearly eight years." Madeline Hann was interred in Yeovil Cemetery and her name is inscribed on the War Memorial in the Borough. Myrtle Harrison, of 99 Preston Grove, was killed while sheltering in an air raid shelter in the garden of 103 Preston Grove. The shelter received a direct hit during the second air raid of 8 October 1940. The Western Gazette reported in its edition of 18 October 1940 "Amid many signs of sympathy the funeral took place at Barwick Parish Church of Mrs Myrtle Florence Mary Harrison, wife of Mr A D Harrison. Mrs Harrison, who was the daughter of Mr and Mrs C Gillard, of Barwick, was 29 years of age. The service was conducted by the Rev HWJR Heywood, formerly rector of Barwick, and the Rev CB Harris, the present Rector." Her name is inscribed on the War Memorial in the Borough. Agnes Hayward of 25 St Andrews Road was killed during the first Yeovil air raid on 7 October 1940 when a high explosive bomb made a direct hit on her home. Her name is inscribed (as M R Hayward) on the War Memorial in the Borough. This name is inscribed on the War Memorial in the Borough but is thought to be a duplicate (with a different spelling) of Agnes Hayward (above) inscribed as M R Hayward. Lily Hoyle, of 23 Westland Terrace, was the wife of Samuel Hoyle. She and her son Trevor (see below) were killed during the fifth air raid on Yeovil of 26 March 1941 when the Westland Road area was bombed. Their home received a direct hit and was completely destroyed. Lily was 29 years old and was interred in Yeovil Cemetery. Her name is inscribed on the War Memorial in the Borough. Trevor was five years old and, although he was known to have been at home with his mother Lily (see above) at the time of the air raid, his remains were not recovered and he has no known grave. His name is inscribed on the War Memorial in the Borough. Albert Hussey of 16 Gordon Road was critically injured when a single bomb landed in the gardens of 13 to 16 Gordon Road, dropped by a pair of Focke Wulf FW190 fighter bombers during the tenth and final air raid on Yeovil during 5 August 1942. Albert Hussey died in Yeovil Hospital later that day. The Western Gazette reported in its edition of 14 August 1942 "The funeral took place at Yeovil Cemetery of Mr Albert Victor Hussey, aged 46, a native of the town. He had been employed at the Corporation Gasworks as a van driver for 18 years and he had been a member of the Home Guard for about 12 months, having had previous military experience in the last war, when he served for three years with the Dorset Regiment in France. He was a member of the Yeovil Branch of the British Legion. Married twice, his second wife and a daughter survive him." He was interred in Yeovil Cemetery and his name is inscribed on the War Memorial in the Borough. Linda Johnson of 108 Stiby Road was killed during the first Yeovil air raid on 7 October 1940 while sheltering in Montague Burton's shop in Middle Street. The Western Gazette edition of 25 October 1940 reported "The funeral took place at Yeovil Cemetery on Saturday morning of Mrs Linda Christine Johnson, wife of Mr Kenneth Johnson, who died at the age of 29 years. Mrs Johnson was a native of Yeovil being the eldest daughter of Mr and Mrs CS Davis, of 6 Westland Terrace. She is survived by her husband and two children." She was interred in Yeovil Cemetery and her name is inscribed on the War Memorial in the Borough. Florence Lumber of 119 St Michael's Avenue was killed while sheltering in the air raid shelter at the Vicarage Street Methodist Church when a high explosive bomb hit the shelter during the first air raid on 7 October 1940. The Western Gazette edition of 18 October 1940 reported "Many friends and fellow church workers in St Michael’s parish attended the funeral of Mrs Florence Gertrude Lumber, wife of Mr Leonard A Lumber. Mrs Lumber, who was a native of Yeovil, was a member of the Parochial Church Council and of the Women’s Fellowship and Mothers’ Union, and an active worker generally in the social and entertainment activities of St Michael’s. The service at the church and at the Cemetery was taken by the Vicar (the Rev SV Purcell) and the Assistant Priest (the Rev EH Baker)." Florence Lumber was 44 years old and was interred at Yeovil Cemetery. Her name is inscribed on the War Memorial in the Borough. Albert Mitchell of 8 Grass Royal was killed when a single bomb landed in the gardens of 13 to 16 Gordon Road, dropped by a pair of Focke Wulf FW190 fighter bombers during the tenth and final air raid on Yeovil during 5 August 1942. The Western Gazette edition of 14 August 1942 reported "The funeral took place on Saturday of Mr Albert George Mitchell, elder son of Mr and Mrs A Mitchell, 17 Cromwell Road whose death occurred at the age of 38. A clerk at Messrs WJ & EG Ricketts & Company’s glove factory, he was also a member of the Royal Observer Corps, and had been connected with St Michael’s Church and the Yeovil Parish Church. He was married and leaves a wife and an eight years-old son. The service in the chapel and at the graveside was conducted by the Vicar of Yeovil (Rev H Mortlock Treen) in the absence from home of the Vicar of St Michael’s (Rev SP Purcell). His name is inscribed on the War Memorial in the Borough. (See Leslie Forsey above). Myra Morris was aged 50 and was interred in Axminster cemetery. Her name is inscribed on the War Memorial in the Borough. Hilda Mulhall of Yeovil Marsh was killed at the Westland Aircraft Works during the fifth air raid on 26 March 1941. The Western Gazette edition of 4 April 1941 reported "The death occurred suddenly last week of Mrs H Mulhall at the age of 43. She is survived by her husband Mr Harold Mulhall. The funeral was on Monday at the Yeovil Cemetery, and was conducted by Preb GRG Norris, Vicar of Crewkerne." Her name is inscribed on the War Memorial in the Borough. 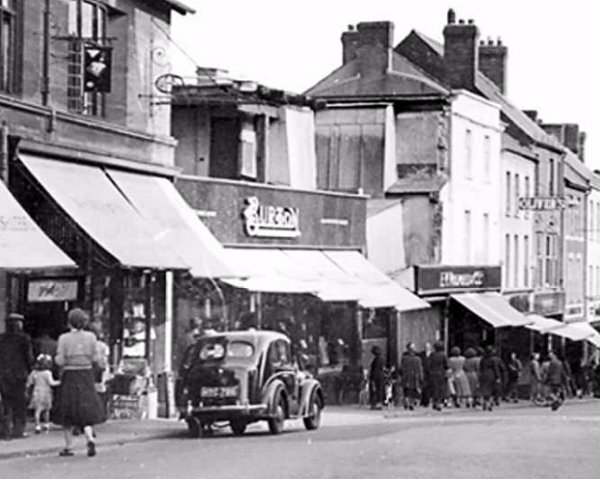 Alfred Palmer was killed was killed during the first Yeovil air raid on 7 October 1940 while sheltering in Brice's Billiard Room above Montague Burton's shop in Middle Street. The Western Gazette's edition of 7 October 1940 reported "The funeral of Alfred Aubrey Palmer, only son of Mrs A Palmer and the late Mr A Palmer, who died at the age of 26, took place at the Cemetery, the Rev EA Baker, assistant priest at St Michael’s Church, officiating." His name is inscribed on the War Memorial in the Borough. Violet Pickard of 48 Grove Avenue was sheltering in the air raid shelter at the Vicarage Street Methodist Church when a high explosive bomb hit the shelter during the first air raid on 7 October 1940. She was fatally injured during the explosion and died in Yeovil Hospital later that day. The Western Gazette edition of 18 October 1940 reported "The funeral of Mrs. Pickard, wife of Mr Walter Pickard, and elder daughter of Mr A Vickery, took place at Ash Churchyard on Thursday. The Rev EA Davies assisted by the Rev Timothy, Vicar of Malmesbury, officiated, and the service was choral." She was aged 47 and her name is inscribed on the War Memorial in the Borough. Lawrence Pritchard of 43 Westland Terrace was mortally injured at the Westland Aircraft Works during the fifth air raid on 26 March 1941. He died in Yeovil Hospital later that day. The Western Gazette edition of 4 April 1941 reported "The funeral took place on Monday, the Vicar of Yeovil (Rev H Mortlock Treen) officiating of Mr Laurence Dreyfus Pritchard, who died at the age of 41. Mr Pritchard, who was born in Yeovil, served in the Royal Navy during the last Great War, having joined the submarine service at the age of 17. He left the Navy in 1931, and came back to his native town about two years ago. He leaves a wife and two sons aged 9 and 10, with whom much sympathy is felt." His name is inscribed on the War Memorial in the Borough. Cyril Rendell was killed by a bomb while he was delivering bread in Summerleaze Park during the first Yeovil air raid on 7 October 1940. The Western Gazette edition of 18 October 1940 reported "The funeral of Mr Cyril Henry Rendell of 6 Uplands, West Coker, took place on Thursday. Mr Rendell, who was aged 36 years, leaves a wife and three young children aged nine, six and three years respectively. For over 20 years he had been employed at Messrs Pulman’s bakery. The funeral service was conducted by the Vicar of West Coker and the Rector of Hardington Mandeville." He was buried in West Coker churchyard and his name is inscribed on the War Memorial in the Borough. Frank Rose was killed during the first Yeovil air raid on 7 October 1940 while sheltering in Montague Burton's shop in Middle Street. The Western Gazette's edition of 18 October 1940 reported "The death has occurred of Frank William Rose, aged 17, the only son of Mr and Mrs Fred Rose, of 214 Sherborne Road, Yeovil. He was educated at Yeovil School and was a member of the Rugby team. His pleasant disposition and musical ability made him popular among a wide circle of friends. Recently he took part in a concert in the Odeon Theatre, and he was organising an entertainment for St Michael’s Young People’s Club, of which he was a member. The entertainment, which was to have been given on Friday evening, was abandoned. He was a server at Holy Trinity Church, where a service was held preceding the interment at the Cemetery." He was buried in Yeovil Cemetery and his name is inscribed on the War Memorial in the Borough. Elizabeth Smith was killed during the first Yeovil air raid on 7 October 1940 while sheltering in Montague Burton's shop in Middle Street. The Western Gazette's edition of 25 October 1940 reported "The death has occurred of Mrs Elizabeth Jane Smith, aged 72, widow of Mr Henry George Smith, a former chairman of the Yeovil Liberal Club, and a retired official of the Prudential Assurance Company, who died in November last year. Mrs Smith, a daughter of Mr and Mrs Salter of Yeovil, leaves a son, Mr Ralph W Smith of London. The funeral was at Yeovil Cemetery, Rev SV Purcell, vicar of St. Michael’s officiating." Her name is inscribed on the War Memorial in the Borough. Lawrence Sweet of 105 Preston Grove was killed while sheltering in an air raid shelter in the garden of 103 Preston Grove. The shelter received a direct hit during the second air raid of 8 October 1940. The Western Gazette's edition of 25 October 1940 reported "The death has occurred of Lawrence Anthony Sweet, aged nine, the youngest son of Leading Seaman and Mrs E Sweet, with whom much sympathy is felt. Lawrence attended the Huish Boys’ School and Holy Trinity Sunday School, and his disposition endeared him to all. The funeral took place at Yeovil Cemetery last week, interment being preceded by a service at the Holy Trinity Church, the Rev J Lloyd Armstrong officiating." His name is inscribed on the War Memorial in the Borough. Wendell Tucker was killed during the first Yeovil air raid on 7 October 1940 while sheltering in Montague Burton's shop in Middle Street. The Western Gazette's edition of 25 October 1940 reported "Deep sympathy is felt throughout the village (Long Load) for Mr and Mrs Jesse Tucker, whose eldest son has died at the age of 20. Evidence of his popularity was shown at the funeral on Tuesday when a service was held in the parish Church, the Rev Hugh C Pearse officiating." His name is inscribed on the War Memorial in the Borough. Jean Young was killed while sheltering in an air raid shelter in the garden of 103 Preston Grove. The shelter received a direct hit during the second air raid of 8 October 1940. In its edition of 18 October 1940 the Western Gazette reported "The death has occurred of Miss Jean Elsie Young, aged 16, the only daughter of Mr and Mrs HS Young, of 37 Everton Road, Yeovil, formerly of Gillingham, in which town Miss Young was born and educated and where she was actively connected with the Girl Guide movement. She was attached to Holy Trinity Church and the Vicar (the Rev J Lloyd Armstrong) officiated at the funeral on Friday at Yeovil Cemetery. Miss Young’s three brothers are all serving in HM Forces, one of them in Egypt." Her name is inscribed on the War Memorial in the Borough. Joyce, three-year old Maxwell and Jimmy Fitkin, who were all killed when a German bomb landed on their air raid shelter in Preston Grove. This photograph dates to the late 1940s or early 1950s - at centre is seen the bomb damaged Burton's tailors shop where eight civilians were killed.